Power through your workday like a Formula One racer! PitStop race-inspired furniture provides a unique way for race fans to maneuver the workday racetrack with ease. 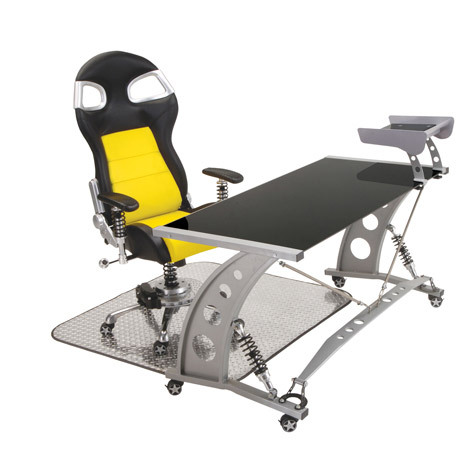 The PitStop LXE Complete Office Furniture Set is the perfect way to transform your mundane office into a race fan�s dream. Sleek and thoughtful designs coupled with stylish race-inspired details ensure a workspace with head-turning good looks and turbo-charged functionality. With the PitStop LXE Complete Office Furniture Set, you�ll find yourself racing to meet any task! The PitStop LXE Series Race Chair features a design modeled after the bucket seat of a genuine race car. Inflatable lumbar support within the bolstered PitStop LXE Series Office Chair provides comfortable lower back support to an area 12� wide x 14� high. Padded armrests are accented by tire tread embossing and have three height options for maximum comfort throughout your workday. A billet aluminum shift knob provides access to four available seat height settings. The base of the PitStop LXE Series Office Chair is highlighted by a brake caliper kit and racing suspension spring. For the ultimate stability, the PitStop LXE Series Office Chair sits on a 26� wide track aluminum alloy base and glides through your workspace on 22� style racing wheels. Pit Stop Furniture from Jons Van Dooren on Vimeo. PitStop Office Furniture is designed and assembled in the USA from the highest quality materials available. PitStop Products are backed by an Intro-Tech Automotive, Inc. lifetime warranty. The quality in craftsmanship is evident in each piece of PitStop furniture.